How Much Mulch Should I buy? Marietta Mulch Vivid Red Mulch uses only the best colorants from industry leading manufacturers, including Heartland Ultra Enriched Colorant by Amerimulch. One of our biggest selling points on our Vivid Red Mulch is the bright, vibrant hue and color retaining capacity. 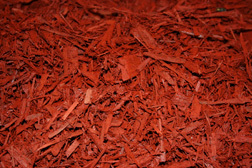 Marietta Mulch doesn't just look great when it is delivered, it holds its eye catching red color from spring till winter. The colorant used in Marietta Mulch's Red Mulch is highly resistand to UV fading from exposure to the sun and won't wash off even in the hardest of rains we get here in Marietta, Georgia. 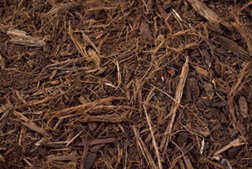 Marietta Mulch's Walnut Brown Landscape Mulch looks great at your business or residence along side the building or under trees. The dark brown mulch will blend into any landscape and make flowering trees and shrubs pop with vibrant color. 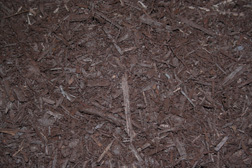 One huge benefit to Marietta Mulch's Walnut Brown mix is the consistancy and longevity of our deep rich color. All of our colored Mulch's at Marietta Mulch contain no VOC's or other harmful substances. In fact our colorants use the same formulations as many color fast products such as lipsticks, comsetics and food containers. Marietta Mulch's Richmond Black Mulch is the deepest, darkest black mulch you can buy in Marietta, Georgia. This elegant color choice is a perfect way to accent the unique architecture of your home or office. The deep dark color absorbs light allowing your landscape to really stand out. Our Heartland Enriched colorant has color-safe technology engineered into every scoop. This means that all the Colored Mulch at Marietta Mulch is completely safe for shrubs, plants, trees, pets, and children and will not fade all summer long. 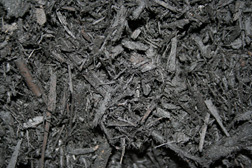 Come and get your Richmond Black Color-Safe Mulch today, right here at Marietta Mulch! Marietta Mulch's Country Club Blend is a natural undyed hardwood blend. This blend was specifically designed for the Marietta Country Club to give the Golf Course a natural appearance. This hardwood blend is composted, ground, and triple screened, just like the colored mulch, but left in its natural state. This Mulch Blend, is just as beneficial for plant health as the colored mulch. An added benefit is that it breaks down more quickly, releasing nutrients back into the soil at a faster rate. Country club blend aslo cuts down on water loss in the soil due to evaporation. For healthier more natural looking mulch order the Country Club Blend today. Cypress mulch has been a perennial favorite. But the truth is that cypress mulch isn't what it's made out to be. 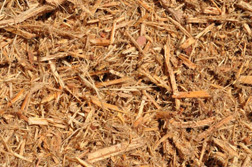 Its popularity is based upon the idea that cypress mulch contains natural chemicals that fend off insects and resist rot. And it did back in the days when the mulch was made from full grown, fully developed, century-old trees. But that's no longer the case. The demand for cypress timber and mulch has led to an unsustainable over harvesting of cypress trees, so much so that all cypress mulch now comes from immature trees that have not yet developed the properties that made its mulch so popular in the first place. At Marietta Mulch we use sustainable forestry practices using a false cypress blend. This blend is made from hardwood trees and is processed to mimic a cypress blend which gives the beautiful appearance of cypress mulch without the negative impact to the enviornment. Call Marietta Mulch today to order the environmentally responsible Imitation Cypress Blend.